Meet Hugo Van and Caroline Taylor. Caroline has been in catering for many years and is a qualified Cordon Bleu chef. She has worked in the City of London for several years, serving Directors dining rooms through to Head Chef at Loch Fyne Restaurant in Elton. She has cooked countless private dinner parties, lunches, shoot events, private parties and also has catered for many weddings and now has decided to go on a different route with Hugo. Hugo was built in 1976 in France and was in fact built to be a horse box, hence the higher roof. In 2013 Monsieur Faurle sold Hugo to a company in England where he was converted into a coffee and soup van based in Cambridgeshire. 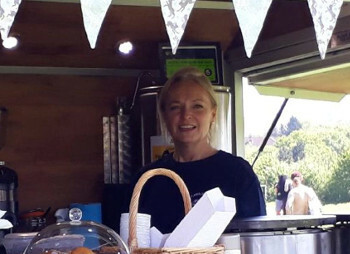 In 2017 Caroline bought Hugo and brought him to Wiltshire and had two French Iron Griddles installed to cook crêpes on and so now is going to festivals, weddings, shows, private parties and corporate events selling crêpes, chilli, bespoke coffee, pukka tea and hot chocolate. All the food is made with the freshest of ingredients and the crêpes are made with the most delicious fillings. Our chilli will suit everyone and we have a Caribbean chilli Sauce to spice it up supplied from Wiltshire Chilli Farm. We provide fresh bespoke coffee supplied by James Gourmet Coffee, Pukka Tea and Monbana hot chocolate which can have whipped cream and marshmallows added to make it even more luxurious. Distance and timing are not an issue although we travel at a steady speed of 40mph (that’s downhill). Hugo can also travel on a trailer so destinations is never an issue.